So, my parents have become these healthy, weight-loss animals. They have inspired you. I have inspired you. You want to do it. Now what? I have written about why I prefer to be mostly vegan. It has been a wee bit of the basics. Yet, some of you are still asking, "HOW? MAKE IT SIMPLE!!" (okay, that's more of a question and then a very loud demand, but I can't blame you). Let me help you get your vegan groove on. First, if you are a plan-ahead type of person, it is just the right time to start preparing yourself mentally and join the 21-Day Vegan Kick Start. DANG, you have good timing. It begins September 6th. You'll get recipes and encouraging videos. I definitely gleaned some stuff from it last year. HOWEVER ... while that is a good boost, most of you are going to walk away from it the first time you open up the recipes and read, "Beets in Dill Sauce." Cause, I know what you're thinking, "Dude, we eat at Arby's. Tuesday nights are Sonic brown bags. I don't mind ordering fancy when I'm at a restaurant, but COOKING fancy? Are you kidding me? I've got a half hour and my local HEB. Don't be using words like 'bisque!'" Ahhhh, hello normal people. I adore you. I LOVE to eat fancy, but I sure as hey-diddle do not like to cook fancy when I've been going all day and I'm already fantasizing about getting to bed. Not to mention ... fancy for seven people? Just kill me. So, let me show you how we do it. First, you can make pretty much anything vegan. Just, ya' know, leave out the meat. - You can add in some beans for protein and fiber and yum. - Use Smart Balance for any margarine needs (again not 100% vegan - has some milk whey - but just misses it by a tiny margarine .... er, margin). - Sub in almond or soy milk for cow's milk. - Sweeten with natural sweeteners instead of white sugar. - You can substitute milled flaxseed for eggs (1 TB milled flax with 3 TB water). I could go on for days. You can still get some of your classics and comfort foods. Think about what you already love, and how you could make substitutions. I also make some other healthy swaps, the big one being whole wheat and whole grain over anything white (bread, pasta, etc.). And, of course, I'm going to encourage you to incorporate more vegetables. But not like you're used to vegetables. 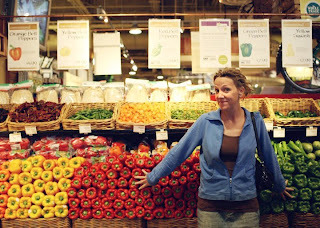 I'm going to ask you to go on a blind date with the produce section and slowly fall in love. Coming up next, I will post on how to approach your meals: breakfast, lunch and dinner (or whatever you call the last two, based on where you live). Do we need to call VPS on you, Christine? Veggie Produce Services? Really? You go, girl. Squeeze the Charmin, and the bells, too! Keep on encouraging us, Christine. I'm slowly convincing my family to join me on my quest. Keep on posting those hints and tips and recipes! I went to the doc the other day and was completely frustrated when I left. She told me all vegans are fat and that the reason I'm fat has nothing to do with the medications she prescribes. Yet my blood sugar is consistently too high. "But that only happens when you eat, so it's not a big deal!" Um, ok. I guess I should stop eating ANYTHING. Somehow I don't see that working out too well. Loving you forever for the Gluten-Free Vegan link. Mwaah! I was randomly going through the food isles at my local (1 hour away) Target and I grabbed up a can of black beans. To say that I'm hooked is an understatement! I personally have been Gluten Free/Casein Free for 6 months now (and have dropped 40 lbs). I have 50-70 more to go! WOO! Off to feel up the broccoli! YUM! Good good good. Yeah, the soy is an issue. I'm so glad just to be getting ideas. I'm not willing to give up real eggs and cheese, but we're always looking to skip the meat. I'm not sold on soy, too many conflicting reports, so we limit it as mch as we can. Not that I don't dig tofu in my stir-fry or veggie "meat" in my chili. I wish Almond milk was cheaper, I bet that tastes like heaven. I'm happy you posted the blogs to check out, some of those I hadn't read before. Of late I really like theyearofveggies.blogspot.com and vegancrunk.blogspot.com. Rice milk (pretty cheap, but a added grain)and Hemp milk (a bit pricey) are great substitutes for soy milk. I also don't know if I could ever go dairy and egg free, but meat is almost out the door! I've never made anything off here that tasted bad. She even has a section of kid approved items. Your blog is wonderful! Just wanted to let you know I'm a new reader, and ENJOYING! Jumping on the banwagon with you!! Getting me some veggies and throwing out the crap :) thanks girlfriend!! I'm new to your blog and love it! This post is perfect timing. We're getting ready to go on a vegetarian stint...vegan is pretty much out of the question cause, er...we live on a farm, have a milk cow and goats, chickens, pigs, beef cows, etc. We eat what we grow, and eat very seasonally, This is the season that the freezer is almost completely empty of meat! Perfect timing to go vegetarian for a few months. I'm also banning the white sugar and flours (which we pretty much do anyway...but its amazing how they sneak back into the house!) We'll continue to consume the raw milk though. So thank you for sharing the wonderful recipes and resources! uhh... before anyone shouts at you, I'd like to *gently* point out that honey is not vegan. It does appeaer to be super healthy, but definitely an animal product and depe3ning on one's reasons for switching, maple syrup*, agave or stevia are all delicious plant-based sweeteners. Depending on the recipe, I often use unsweetened apple sauce because it is fairly cheap. *real maple syrup. Remember to read the label. The fake stuff is probably worse than white sugar. Val, while I realize most new people don't have time to go through all of my posts, I have actually talked about honey before. I am not vegan due to avoiding any and all animal products at all cost. I am vegan for health purposes (actually agree with many animal cruelty issues, but have no moral qualms with honey, and actually witness it being collected locally). But I also DO occasionally get yelled at for ever having any animal products at all. So, the purists rip me a new arse hole regularly. I'm kinda' used to it. ha. I'm somewhere in the middle. I have found that eating raw vegan until dinner and then eating a cooked dinner that may or may not contain animal products works well for me. I've read a lot and the book that seemed to make the most intuitive sense to me was Real Food by Nina Plank. So I do this bizarre, contradictory 'diet' of raw vegan followed by Real Food style dinner, I feel best. I'm on the fence with soy, even after reading the post on soy above. Non-fermented soy is a relatively new food and most veggie shreds/soy cheeses/soy meats/etc tend to be a bit too processed for my taste. Glad you are bringing awareness to vegan and plant based diets!